An ambitious project unfolded behind closed doors in Saignelégier in Switzerland's Franches-Montagnes district. Aerowatch SA and the Japanese Toshiba Group 株式会社東芝set out to jointly develop an intelligent watch. It combines Swiss watchmaking traditions with the apex of technological innovation. The high-tech marvel will be unveiled at Baselworld 2013. Saignelégier, 24th of April 2013. The Japanese Toshiba Group is innovation-driven and determined to play a significant role in the middle-range segment of the market for intelligent timepieces. It targets consumers who are fascinated by the latest technologies but also place emphasis on horological artistry and refined design. Now manifested in a revolutionary watch, this seemingly contradictory combination is the outcome of a 10-month period of collaboration between Toshiba, the world's largest electronics and IT corporation, and Aerowatch SA, a watchmaking company with a heritage of over 100 years. Aerowatch is recognized the world over for its know-how and the outstanding quality of its timekeeping instruments. The collaborative venture was a considerable challenge for the innovation-focused, family-owned enterprise. Originally specialized in the development of pocket watches, the company successfully evolved its business in the domain of wristwatches. Founded in 1910 in La Chaux-de-Fonds, the historic cradle of the worldwide watchmaking industry, Aerowatch has consistently aligned itself with the expectations of an ever-changing market. The amalgamation of traditional watchmaking skills with cutting-edge technologies marks a transition and a milestone in the rich history of the Swiss manufacturer. The opportunity to collaborate with a major electronics and IT player allows Aerowatch to contribute to the development of new products and simultaneously advance traditional Swiss watchmaking techniques. One of the special features of the new aesthetically appealing, avant-garde timepiece is that if offers virtually infinite variations in the design of dials and hands. The buyers of this high-tech watch can reconfigure and personalize its appearance to suit their preferences. Endowed with classic smartphone applications and software developed by Toshiba's most talented engineers, the watch incorporates all the functionality of conventional timepieces. - Aerowatch was founded in 1910 in La Chaux-de-Fonds. - 1942 The family Crevoisier took over the watch factory in Neuchâtel. The company became specialists in the making of pocket watches and pendants. - 1959 Georges Crevoisier developed a qualify distribution network in 35 countries. - 2001 Aerowatch is handed over to family Bolzli. 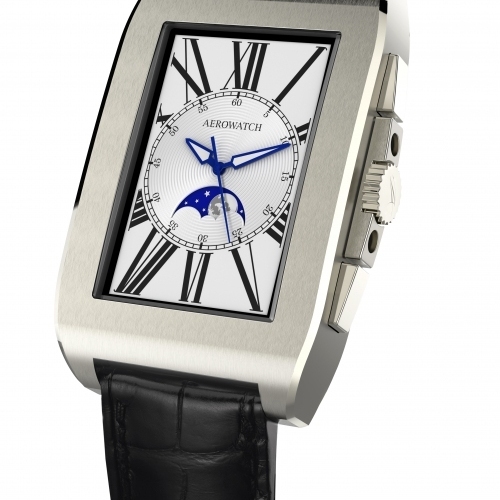 - 2005 Creation of the first wristwatches collection inspired by vintage pocket watches. - 2008 Aerowatch moves their activities to Saignelégier in a large luxury house dated 1896. 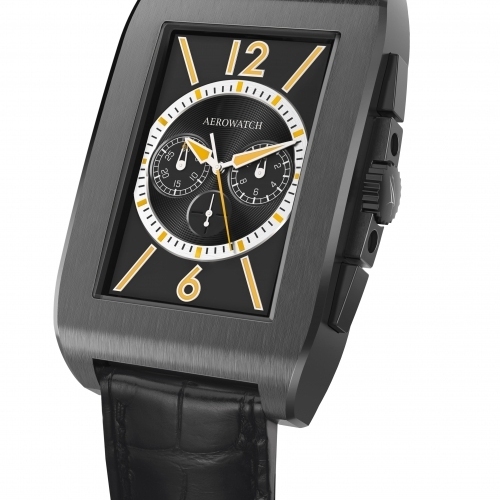 - 2010 Aerowatch celebrates a century of uninterrupted watchmaking activity. The independent family-run Swiss business is represented in 43 countries and is present in 110 Swiss point of sales. - 2013 Aerowatch SA and the Japanese Toshiba Group set out to jointly develop an intelligent watch that is world première presented in Baselworld.